One of the leading Florentine artists of the period, Daddi carried with him the influence of the early Renaissance from Giotto di Bondone (1267 – 1337). Said to have trained under Giotto; Daddi’s documented works date as early as 1312 and up until 1347, just before his death. 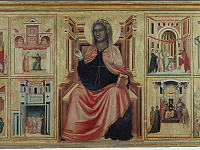 His work was also influenced by the graceful Sienese style of artists like Pietro Lorenzetti (1280 – 1348). One unique contributing influence on his work was that of Ivory carvings from France, which enhanced his style’s more lyrical attributes seen from the Sienese influence. Daddi helped to capture Giotto’s progression of art from the Iconic painting of Byzantine art into the Renaissance’s more natural forms. Though he was still an artist influenced by Ancient Roman styles; using figures with the unmistakable almond-shaped eyes and golden halos behind their heads, set in front of highly decorative, golden backdrops. This is seen in works such as his Crucifixion, painted between 1340 and 1345, where the representation is still Iconic and slightly abstract, but his Christ figure takes on the human, earthy presence of the Renaissance. Most of his works were created with tempera on wood and he produced very few frescos. 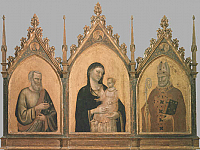 Several of his pieces are in the Uffizi Gallery, including three pieces depicting the Virgin and Child, Madonna and Child with Saints Matthew and Nicholas, Madonna and Child Enthroned, Madonna and Child with Saints and his polyptych panels from the Church of San Pancrazio. 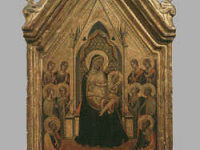 The Madonna and Child with Saints Matthew and Nicholas, originally painted for the Monastery of Ognissanti in 1328, is noted as a strong example of his style. His works are also on display at Walters Art Museum in Maryland, U.S., the National Gallery of Art in Washington D.C., the Gardner Museum in Boston, U.S. and in the Getty Center in Los Angeles, U.S.